Losehill Hall is a Victorian country house on the outskirts of Castleton currently used as a Youth Hostel. 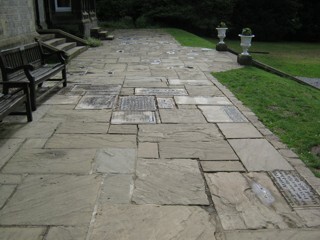 I noticed the terrace has been paved using old gravestones which are still legible though they have been cut up. The deaths of the people they refer to were mainly registered in the Cheshire/ Lancashire border area so they are not from the local church. If anybody can explain how they ended up here let us know. Some of the missing details have been obtained from online records and so are not certain to be correct. The GPR holds 8 grave and 23 person records for the cemetery.